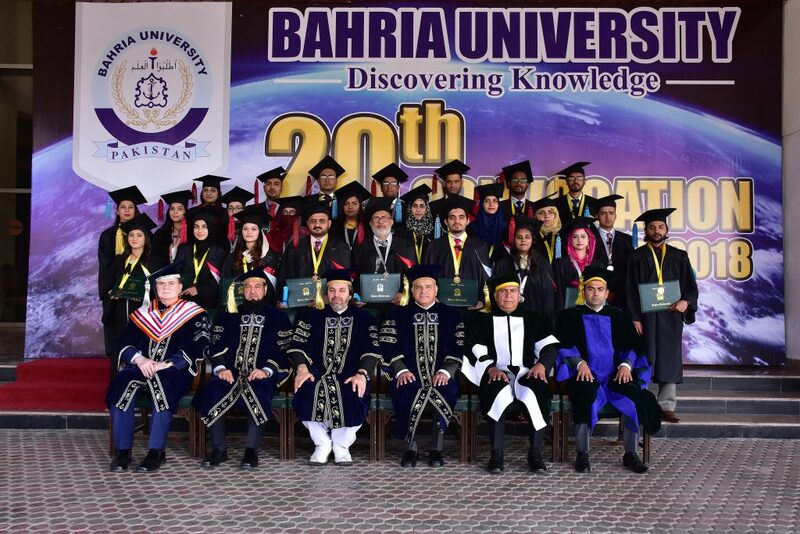 Bahria University Islamabad Campus held its 20th Convocation at Jinnah Convention Center Islamabad. Mr. Ali Muhammad Khan, Minister of State for Parliamentary Affairs graced the occasion as Chief Guest. Rector Bahria University conferred the degrees to the graduating students of Ph.D, MPhil, Masters and Undergraduate programs. In total 686 degrees were conferred to the Undergraduate and Graduate students of Management Sciences, Humanities & Social Sciences, Computer Sciences, Law, Earth & Environmental Sciences, Electrical Engineering and Software Engineering Departments. Mr. Ali Muhammad Khan also awarded 16 Gold and 13 Silver medals, to various students who achieved top positions in their respective programs. While addressing on the occasion, Mr. Ali Muhammad Khan congratulated the graduating students on their splendid success and lauded Bahria University Islamabad Campus for providing exceptional knowledge skills to the graduating students in their respective disciplines enabling them to lead a professionally rewarding life. He appreciated the role of Bahria University for contributing to and in strengthening human resource of the country. While addressing the students, the Chief Guest said that “I feel delighted to see the burgeoning number of successful graduates Bahria University is producing every year. The intellect that is fostered here and the body of knowledge that is created will certainly become an engine for the developmental process in Pakistan in years ahead. Universities are immensely important in building the human capital of any nation and Bahria University is one of the institutions leading the way”. He also appreciated the efforts of the University management for emphasizing skills development of the students that makes Bahria University an attractive institution for teaching and learning. He encouraged the graduating students by advising them to be proactive, creative and to follow their passion and dreams; urging the academia to contribute something of value to the society. Earlier in his welcome address Rector Bahria University Vice Admiral (R) Muhammad Shafiq HI (M) expressed his gratitude to Mr. Ali Muhammad Khan for his presence at the convocation. He further added that we at Bahria University have done our best to equip our students with necessary fundamental principles of conducting scholastic enquiry, training for communication and interpersonal skills. He acknowledged particularly the role of HEC, Punjab Government and other organizations for sponsoring number of scholarships for Students of Bahria University. This support is helping to provide an opportunity to students coming from low income background to pursue quality education. Rector Bahria University congratulated the students and their parents, wishing them a prosperous future and also appreciated the students winning medals in recognition of their outstanding performance.